Dizzy is our School Dog. He is a black Cockapoo and he is 2 years old. Cockapoos are hypoallergenic and shed very little so this shouldn’t be a problem for children with allergies. They are also intelligent, outgoing, loving, gentle, have a fantastic temperament and are small not intimidating. Dizzy has been selected from a very reputable and approved breeder. 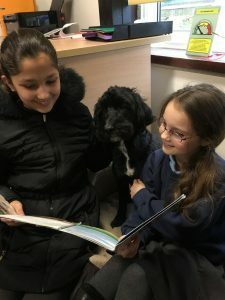 School dogs have become increasingly popular in the recent years and this is due to the fact that extensive research has shown that dogs can significant benefits to children. Dizzy’s main place of residence is in Miss Francis’s office, which is secure and separate from the classrooms. 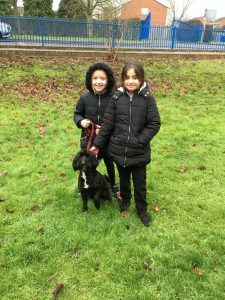 Children learn the principles of good pet ownership and will be taught how to approach and handle dogs safely and responsibly; Miss Francis and Dizzy will follow rules to ensure that everyone feels safe. At no time is Dizzy left unsupervised with children and anyone in contact with Dizzy are reminded to wash their hands after working with him. We’re sure your child will really enjoy seeing Dizzy in school and will be keen to be involved with him. If you have any questions, please speak to Miss Francis.